So much gist at home and in the abroad this week. It is no news (forget that it is always on the news) that our President has been away for more than 100 days and still counting. What is new is that Saraki and Dogora went to visit him in London and just like all previous visits by previous visitors, the purpose of the meeting to us is still unknown! But sha, photos were shared (All these photo dem dey share with president, yet him no return to Aso rock. Issalrite oooooo). As Charly Boy talk am, make presido return or resign, my own advise jeje na; make parle Buhari resign. Wetin you tink for the matter? Try something now: type ASUU on Google, it will automatically give you options of different years of ASUU strikes (ASUU strike 2017, ASUU strike 2016, ASUU strike 2015 and so on). You actually did it… is it true? 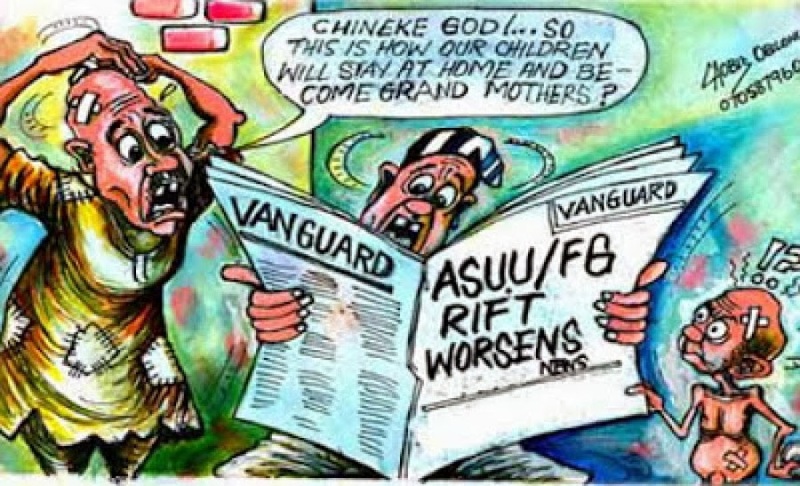 Sad as it is, there is nothing as consistent in the academic calendar of Nigerian universities like ASUU strike. Very soon, school would start allocating time for strikes in their calendars… but really it is not funny! At this rate, ASUU strikes faster than thunder and it still does not seem like a permanent solution is in view yet. Just the temporal fixes that last for a year or two and we are back to the same point. I think the solution to our problems lies so much in budget allocation and accountability. Increase the budget allocated to Education by maybe 5% yearly till you hit a certain percent, and then sustain that level, while radically implementing policies that strengthen the educational institution. Policies like public servant’s (politicians we call them) children must school in public schools. You gerrit? Mama the mama has finally spoken! She said categorically that it is impossible to forfeit what was never hers. So all this money EFCC has been calling around and pointing accusing fingers at her, who owns it? Who to believe? Mind dey talk one tin but abeg make person no talk am before dem go sue askIBK for defamation of character. By the way, is Kemi Olunloyo out of prison now? (we need to get on top of that). On Diezani, let’s watch to see where this leads. As we dey wait, wetin be your take for this palava? You know who I am talking about if you used to watch “The Apprentice” (USA). Well, the most respected white house just became a reality show! Oga at the top still sees himself as in a TV show. Biko, when all the credible, reputable, and competent hands have either resigned or been fired, wetin remain? Whether you sing Na who I go ask, or whether you think say na Jamb question, na you we dey ask oh! Our dear brother Adebayo Ogunlesi was fired alongside other CEOs that were advisers to the president. The funniest part is the way USA’s office is now Trump’s Twitter account. The small palm does wonder at typing big things sha. Well that is it for this week! I would fill you in same time next week, hopefully WWIII would not have commenced, but if it has, then carry on your daily life and keep safe. Missile no suppose reach us here. (not the movie) and we promise you would have a smooth & interesting ride with us.